Caroline's Doggie Sudz is an organic, botanically-infused dog shampoo & conditioner. Indulge your pets in a tranquil and spa-like sensation with the soothing essence of natural scents and Neem Oil. Our proprietary natural dog shampoo formula goes above and beyond cleaning and softening your pet's coat by allowing your furry little friend to indulge in a relaxing and rejuvenating aromatherapeutic experience every time they get a bath! Unlike other generic oatmeal dog shampoo products, our combination of organic botanical extracts, neem oil, and oatmeal is ultra-soothing and helps relieve your dog's skin conditions including flea bites, dandruff, and itchy skin. 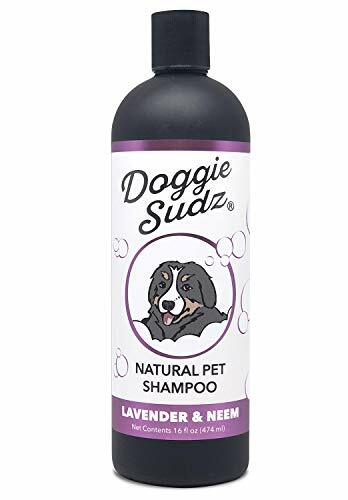 This makes it an ideal choice for someone looking for dog shampoo for itchy skin. Most of the other neem pet shampoo products contain questionable ingredients, but not naturally-scented Doggie Sudz! Our unique formula does not contain any harmful ingredients and is always free from alcohol, pesticides, phosphates, detergents, dyes, SLS, SLES, DEA, or TEA. Give your pets the love they deserve with Doggie Sudz vegan-certified oatmeal dog shampoo. You will never go back to cheaper alternatives after experiencing the difference! PUPPY FRIENDLY - The gentle blend of oatmeal, herbs, and botanicals in our natural formula are tear-free and make Doggie Sudz the perfect puppy shampoo and conditioner. ITCHY SKIN RELIEF - Our ultra soothing dog shampoo provides gentle but powerful ingredients such as Oatmeal, Neem Oil, and Chamomile to provide your furry friend immediate itch relief. POWERFUL NEEM OIL - Neem oil is a pet-friendly natural insect repellent used by many organic farmers worldwide to keep their gardens safe, it has similar effects in flea shampoo for dogs, helping to treat fleas, ticks, and mange. FULL TRANSPARENCY - We only use Certified Vegan and Cruelty-Free ingredients in our pet shampoo, in addition, we make it a priority to ensure our products do not contain harmful chemicals such as pesticides, phosphates, detergents, SLS, DEA, TEA, dyes or fake fillers. If you have any questions about this product by Doggie Sudz, contact us by completing and submitting the form below. If you are looking for a specif part number, please include it with your message.